ESL released an update on the standings for its Intel Grand Slam competition in a tweet published Monday. ​The standings show the five ​Counter-Strike: Global Offensive teams closest to completing the Grand Slam to be FaZe Clan, Astralis, North, Natus Vincere, and Fnatic. FaZe Clan and Astralis have won two events each of the the last ten, placing them the closest to picking up the $1 million prize pool. The rest of the teams sport one win each, spread over the previous seven events. Fnatic has the earliest win still eligible for the Intel Grand Slam, which the team picked up at IEM Katowice in March. It will need to win the next three events in a row to complete the Grand Slam before that win ages out of the circuit. Na'Vi holds the second most recent win from ​its first place finish at ESL Cologne in July, while North has the most recent from ​its victory at DreamHack Stockholm Sunday. ​Announced in June 2017, the Intel Grand Slam rewards the first team to win four of the last ten Counter-Strike majors with a $1 million prize for extended dominance in the CS:GO scene. The eligible events include those from IEM, ESL One, ESL Pro League and DreamHack Masters. 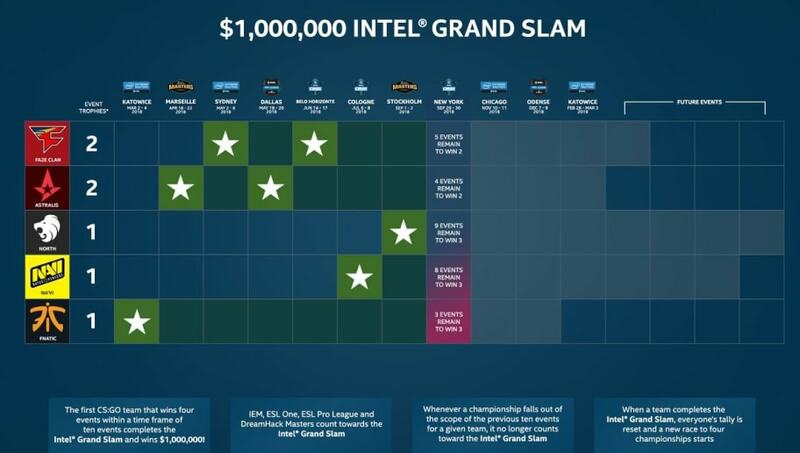 Once a team claims the Intel Grand Slam, the competition will begin anew. The next Intel Grand Slam event will be ESL One New York, scheduled for Sept. 29-30.